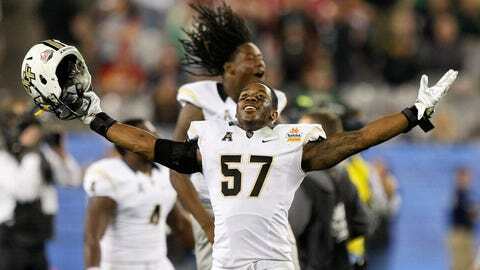 UCF linebacker Troy Gray (57) celebrates as time expires after the Knights' Fiesta Bowl victory over Baylor. Everyone loves a parade, as the saying goes, and the members of the UCF football team are no exception. The Knights got a warm welcome from their neighborhood theme park Sunday, when they took to Disney’s Magic Kingdom and made their way through the park. The celebration was just more good feelings for the Knights, who shocked Baylor in the Fiesta Bowl on Jan. 1 and finished the season ranked No. 10 in the Associated Press poll. Watch below to see head coach George O’Leary, players and fans talk about what the parade experience was like.